Multiple market data vendors, duplicate functions, demanding users, and intertwined systems create significant challenges for any market data manager. Are market data services also a critical challenge in your day to day business? And do you find them complicated to manage and control? 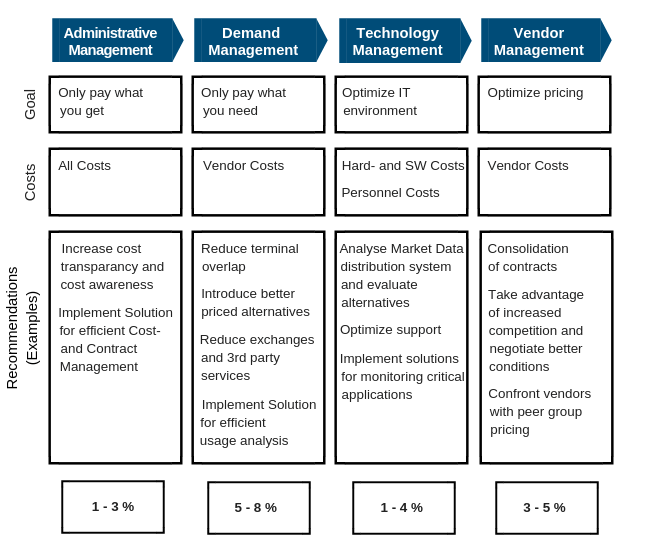 Through optimized administrative, demand, technology and vendor management we help you to identify areas for market data cost reduction. Leveraging our breadth and depth of experience — in both the financial markets and operations consulting — we implement practical and sustainable solutions that quickly increase service, establish control, and reduce costs within your organization. Screen Consultants has conducted over 300 market data reviews for both world leading financial institutions and smaller firms, and has accomplished a 100% track record in achieving significant cost savings whilst maintaining user satisfaction. Our global market data cost optimization projects (Vendor Information Projects – VIP) achieve between 5% and 20% savings within the first year. Screen Consultants’ global market data sourcing program optimizes the mix of market data services across your organization. Our VIP approach is very much focused on optimizing Demand (usage versus alternative analysis) and Administrative Management (billing, inventory mismatch, compliance). We have been able to service our clients successfully, going far beyond just removing unused exchanges and services. We achieve this by relying more on data content and vendor expertise, tools, procedures, and industry benchmarks to qualify which market data services are appropriate and necessary on a user by user basis. Ready to optimize your market data services and reduce your spend by up to 20%? Learn how to optimize your market data spend. Our market data re-distribution review addresses the challenges set by the use of market and reference data in advanced trading models and other applications. Today, financial institutions need to source, manipulate, derive, cleanse, store and distribute data, in numerous ways and on a global scale. Not only does this involve cutting edge technology, ultra-low-latency data feeds and sophisticated distribution mechanisms, but it also means understanding the stringent legalities around the use of external data, within these complex environments. Screen Consultants has been conducting data re-distribution reviews for many years and we understand the intricacies and complexities of the applications which consume and re-distribute market data. This includes the analysis and evaluation of data used within server-based applications, Excel models, internal databases, intranets, internets and other forms of storage and retrieval facilities.